Disney and Buena Vista Interactive are about to give gamers a special treat, as the long awaited Tim Burton's A Nightmare Before Christmas: Oogie's Revenge gets set to land on the Xbox and PS2 later this year. The game is set one year after the events of the original and finds our hero Jack Skelligton once again battling the revived Oogie as he battles to save the holidays and Halloween Town from his evil grip. The game is a third-person action platformer and captures the movie's distinct look and feel, with high-quality visuals and gorgeous animation. The gameplay is solid and feels great, with excellent controls, a dexterous main character and challenging level designs. Join us and find out why this promising license looks to recapture the film's quirky essence. Based on the 1993 cult-classic film, this title's release has been highly anticipated by gamers and non-gamers alike for quite some time. It has been in development for over a year and while the delays have been seemingly endless, the wait seems like it will have been well worth it. 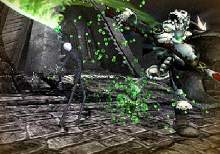 The Nightmare Before Christmas: Oogie's Revenge on the PlayStation 2 is looking just as magical, imaginative and cool as the film was. Set after the events of the original movie, the game features our hero Jack Skellington as he once again tries to save the citizens of Halloween Town from the evil ogre Boogie. A year has passed since the events of the film, and the story begins as Jack Skellington, the Pumpkin King of Halloween Town goes in search of new ideas for next Halloween. When he comes back to the village he finds that his old nemesis, Oogie Boogie has tricked the people into thinking Jack had left angry and wouldn't come back until the had made a more dangerous holiday. Under Oogie's watch, the people had come up with numerous booby traps around town. Even Jack's old friend Dr. Finkelstein had gotten into the act and created an army of evil ghosts and skeletons to haunt the town. Once he controls Halloween Town, he sets to take over the other famous days, and kidnaps many of them, including Cupid and Santa Claus, so he can control all the other holidays. It's up to Jack to battle these foes and Oogie's minions through these areas including several not seen in the film. His mission is to save the other holidays and eventually, to restore Halloween Town to the way it was before he left and regain his place as the Pumpkin King. Before he left Halloweentown, his old friend, Dr. Finkelstein gave him a special device called the Soul Robber. This elastic and slimy device is a greenish extension that's been locked onto his hand. 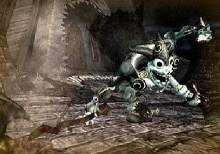 The device gives Jack a number of special attacks and other abilities. It can be used as a whip to attack enemies, a lasso which allows him to swing around and a bungie cord. With the Sould Robber at his disposal and will be able to swing over Halloween Town and fight Oogie's hordes. 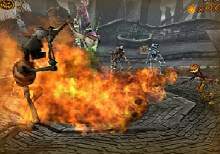 Jack can also perform special attacks, such as throwing surprise boxes at enemies, who are then destroyed when it explodes. In addition, Jack will be able to chain moves together to form combos that will add to his attack strength and powers. As he goes through the game, Jack can also transform into several different personas, each of which will give him a unique set of powers. 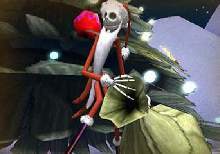 As the Pumpkin King, Jack can use his fearsome appearance and strength to frighten enemies, while as Santa Jack he can use his magical Christmas powers to prevent Oogie and his minions from taking over Halloween Town for good. During the game, Jack will encounter many of his friends including: Zero, Sally, the Mayor, The Vampire Bros., the Clown and Corpse Kid. In addition, he'll come across several new characters. The game will take players to many familiar locations such as Doctor Finkelstein's lab and Christmastown. Each of these areas will be fully interactive, and players will be able to explore them to find hidden items and secrets. However, there will be many new areas in the game such as Jack's House, The Mayor's House, a power station, Graveyards, a pumpkin patch and even a battle at Oogie's Lair. Jack will face numerous enemies throughout the levels, and will also have to get through a number of boss characters to save the holiday mascots. One of the most enduring aspects of the Nightmare before Christmas was its design and look, which used a revolutionary method of stop-motion animation, and Tim Burton's unique imaginative designs to create a look and feel unlike anything else. While it would have been easy to slap a generic game on these characters, this unique license deserves a greater attention to detail than usual. To ensure the authenticity, the original film's art director Deane Taylor is on board while legendary director Tim Burton is supervising the game as well. These new elements look to fit in seamlessly with the original film, which should give Oogie's Revenge an immediate appeal for fans of the films. We're happy to report that the based on our time with the game at E3, the game's design mirrors the unique look of the film and captures its essence perfectly. The smooth animation, beautifully designed worlds and brilliant character designs shine through to create one of the coolest looking games on the current generation of consoles. The design is solid and benefits from a slick engine, smooth controls and intuitive designs that give it a video game feel. However, this doesn't overwhelm the story or the characters, giving it a great sense of balance. In addition to recreating familiar areas and characters, the game will include areas and characters not seen in the films. In addition, Oogie's Revenge will include new songs and music created specifically for this game and many of the original voice actors will return for the game, too. 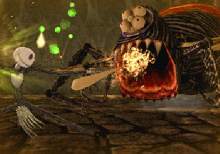 The Nightmare Before Christmas: Oogie's Revenge will have a cinematic feel with extensive cutscenes and a dramatic storyline. This highly polished appearance is impressive without compromising the visual quality that made the films so appealing. The aesthetic excellence is immediately apparent, and it's good to see that Buena Vista and Capcom have taken the extra time and have put in the effort to ensure that The Nightmare Before Christmas lives up to fans' high expectations. There's definitely a lot riding on this title for Buena Vista and Capcom since The Nightmare Before Christmas has built a tremendous following over the past dozen years. The involvement of many of the principal designers, voice actors and director Tim Burton himself should make for an amazing title that remains faithful to the original film's vision without losing sight of what made it so special in the first place. From a visual standpoint, the designers have recreated the distinctly off-beat and dark feel of the film with great character designs and impressive environments. The animation is incredibly smooth and the cinematic approach makes this as close to a real sequel as you could want. However, the developers haven't neglected the gameplay aspects, and Jack's new moves and attacks should make for a seamless experience. Overall, The Nightmare Before Christmas: Oogie's Revenge is looking to be an intelligently developed title that expands the film's evocative world without compromising the aesthetic look that has made the films endure.